The single biggest problem with a gluten free diet is bread. Not only is shop bought bread expensive, it’s also dry and makes really poor sandwiches. In fact my daughter won’t eat it as a sandwich. 2) Diagnosed using medical methodologies and not symptoms only. Well we think my daughter is only wheat intolerant. We have been advised to remove all gluten from her diet to be sure. We also diagnosed via symptoms and to get a full diagnosis would have required putting her back on wheat for at least 4 weeks. Not something that we wanted to put her through at 3 years old! So what do we do? Well, I make bread myself. It’s tricky. In order for your bread to rise you need yeast. Yeast works by reacting with the gluten. See the problem? I use a recipe for cheese and mustard bread (without the mustard) that I got from the recipe book with my Morphy Richards breadmaker. I don’t actually use the breadmaker because I find it makes the loaf too heavy and cake like. I find the best way to get the lightest possible loaf is to make up the mix and then just leave it to prove. Let the yeast react as much as possible with the ingredients in the dough. I bought a sack of gluten free bread flour from the Doves Farm website which keeps us going for a long time too. So every weekend, I roll up my sleeves and make 2 loaves of bread. 1 for the freezer and 1 for the first part of the week. At least this way we have bread that she will eat as a sandwich or as toast. We save money on the expensive shop-bought stuff and I feel like I am actually doing something a little constructive for my daughter! I am still experimenting though. These loaves are more like bread than cake (a common problem in most gluten free recipes) but they are not light enough for my liking yet. 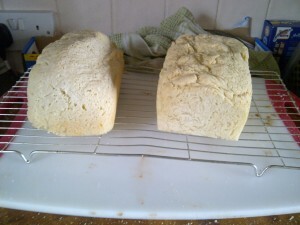 If you are interested here is my recipe for gluten free bread. Bread is now on an ever growing list of gluten free baking I do. Who’d have thought it eh? If you are interested in some great gluten free recipes check out this site.